An unaltered photocopy of your DD-214, OR other military issued document clearly displaying your wartime Gulf Service. The Southwest Asia Service Medal (at right in photo) was established 12 March 1991 by Executive Order 12754 from President George Bush. The medal is awarded to any member of the armed forces for service in prescribed geographical parts of the Middle East during Operations Desert Shield and Desert Storm. The wearing of as many as three service stars on the suspension ribbon and ribbon bar currently is authorized, one for the period from 02 Aug. 1990 to 16 Jan. 1991, a second one for the period 17 Jan.-11 April 1992 and a third one for the period beginning 12 April 1992 and closing 30 Nov. 1995. Members of the Armed Forces of the United States serving in Israel, Egypt, Turkey, Syria and Jordan (including the airspace and territorial waters) between 17 January 1991 and 11 April 1991, will also be eligible for this award. Members serving in these countries must have been under the command and control of U.S. Central Command or directly supporting military operations in the combat theater. The front of the medal, which was designed by the Army Institute of Heraldry, reflects the roles of each of the services with images of tanks, ships and aircraft. The ribbon's dominant color is that of desert sand with other colors alluding to the American red, white and blue and colors representative of allied armed forces. Most sailors and Marines participating in Operations Desert Shield and Desert Storm were presented the Liberation of Kuwait Medal (at left in photo) by King Fahd Bin Abdul Aziz of Saudi Arabia. It was awarded to those who served or flew into the war zone between Jan. 1, 1991, -- the start of the air war -- and Feb. 28, 1991, when offensive operations concluded. The war zone included Iraq, Kuwait, Saudi Arabia, Oman, Bahrain, Qatar and the United Arab Emirates. At sea, the war zone is defined as the Persian Gulf, Red Sea, Gulf of Oman, Gulf of Aden and portions of the Arabian Sea. Basically, service members qualified if they were attached to units participating in ground or shore operations, aboard ships directly supporting military operations, or participating as crew members in aerial missions directly supporting military operations within the war zone. Service members received the medal at no cost, but the logistics of manufacturing and distributing nearly 500,000 medals meant some delays. The medal is suspended from a green ribbon with red, black and white stripes, representing flags of Saudi Arabia and Kuwait. The medal depicts a Royal Palm with crossed sabers - emblems of Saudi Arabia - superimposed on a sunburst, symbolizing the light of freedom "which once again shines over Kuwait." Inside the sun emblem is a globe featuring the Arabian Peninsula. 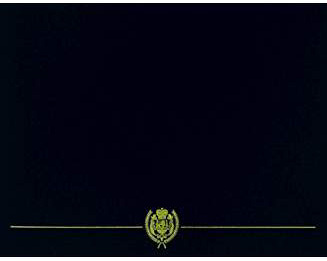 A listing of eligible periods of service is found in the Navy Battle Streamer section. 1. 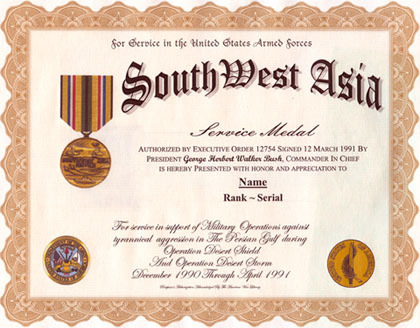 Description: A bronze medal 1 < inches wide, with the words "SOUTHWEST ASIA SERVICE" across the center background. Above the center is a desert scene with a tank, armored personnel carrier, helicopter and camels with the rising sun in the background. Below the center is a seascape with ship, tanker, aircraft and clouds in the background. On the reverse, is an upraised sword entwined with a palm frond and "UNITED STATES OF AMERICA" around the edge. 2. Ribbon: The ribbon is 1 3/8 inches wide and consists of the following stripes: 1/16 inch Black 67138; 1/8 inch Chamois 67142; 1/16 inch Old Glory Blue 67178; 1/16 inch White 67101; 1/16 inch Old Glory Red 67156; 3/16 inch Chamois; 3/32 inch Myrtle Green 67190; center 1/16 inch Black; 3/32 inch Myrtle Green; 3/16 inch Chamois; 1/16 inch Old Glory Red; 1/16 inch White; 1/16 inch Old Glory Blue; 1/8 inch Chamois; and 1/16 inch Black. 3. Criteria: a. Individuals authorized the Southwest Asia Service Medal must have served in support of Operation Desert Shield or Desert Storm, in one or more of the following areas, between 2 August 1990 and 30 November 1995: Persian Gulf, Red Sea, Gulf of Oman, Gulf of Aden, that portion of the Arabian Sea that lies north of 10 degrees North latitude and west of 68 degrees East longitude, as well as the total land areas of Iraq, Kuwait, Saudi Arabia, Oman, Bahrain, Qatar, and the United Arab Emirates. Individuals serving in Israel, Egypt, Turkey, Syria and Jordan (including the airspace and territorial waters) directly supporting combat operations between 17 January 1991 and 11 April 1991 are also eligible for this award. b. To be eligible for the award, a service member must be: attached to or regularly serving for one or more days with an organization participating in ground/shore military operations; attached to or regularly serving for one or more days aboard a naval vessel directly supporting military operations; actually participating as a crew member in one or more aerial flights directly supporting military operations in the areas designated; or serving on temporary duty for 30 consecutive days or 60 nonconsecutive days, except, if a waiver is authorized for personnel participating in actual combat. a. Medal (regular size): MIL-DTL-3943/243. NSN 8455-01-334-9513 for set which includes regular size medal and ribbon bar. b. Medal (miniature size): MIL-DTL-3943/243. Available commercially. c. Ribbon: MIL-DTL-11589/356. Available commercially. d. Lapel Button (ribbon replica): MIL-DTL-11484/177. Available commercially. e. Streamer of the same pattern as the ribbon is authorized for units that received campaign credit participation. The inscription will be as indicated on the unit's lineage and honors. 5. Background: a. In October 1990, the Deputy Director of Personnel and Administrative Services, Office of the Secretary of Defense (OSD), requested that The Institute of Heraldry provide proposed designs of a service medal for Southwest Asia. Proposed medal designs were forwarded to OSD on 30 October 1990. A proposed Executive Order to authorize the service medal was staffed to the Services, by OSD, on 11 February 1991. President Bush established the Southwest Asia Service Medal by Executive Order 12754, dated 12 March 1991.
b. The medal selected was designed by Miss Nadine Russell and recognizes the joint-service nature of the operation. It depicts a tank, armored personnel carrier, helicopter, ship and aircraft with a desert and seascape. The reverse side symbolized military might and preparedness in defense of peace. The sand colored ribbon with red, white, blue, green and black stripes represented the colors of the United States and the coalition members. c. Bronze stars are worn on the ribbon to indicate campaign participation by the service member. Three campaigns have been designated - - "DEFENSE OF SAUDI ARABIA" for the period 2 August 1990 through 16 January 1991, "LIBERATION AND DEFENSE OF KUWAIT" for the period 17 January 1991 through 11 April 1991, and "SOUTHWEST ASIA CEASE- FIRE" for the period 12 April 1991 through 30 November 1995.
d. The criteria/policy for the Southwest Asia Service Medal was promulgated by Change No. 1 to DOD 1348-33-M, dated 14 June 1991. This manual established the two campaigns for Southwest Asia. The Joint Chiefs of Staff approved a termination date for the second campaign and established the third campaign per memorandum, dated 3 December 1991, from the Director, Joint Staff, subject: Termination Date for the Second Campaign and Establishment of a Third Campaign for the Southwest Asia Service Medal. a. Authorization. E.O. 12754 of 12 March 1991. (1) Awarded to members of the Armed Forces of the United States, who participated in or directly supported military operations in Southwest Asia, or in the surrounding areas, between 2 August 1990 and 30 November 1995 (Operations DESERT SHIELD, DESERT STORM, and the Southwest Asia Ceasefire Campaign) . the following areas: the Persian Gulf, Red Sea, Gulf of Oman, Gulf of Aden, that portion of the Arabian Sea that lies north of 10 degrees north latitude, and west of 68 degrees east longitude, as well as the total land areas of Iraq, Kuwait, Saudi Arabia, Oman, Bahrain, Qatar and United Arab Emirates. (3) Individuals serving in Israel, Egypt, Turkey, Syria, and Jordan (including the airspace and territorial waters thereof), between 17 January 1991 and 28 February 1991, shall also be eligible for award of this medal. They must have directly supported combat operations. (4) Embassy security guard personnel are eligible for the period 2 August 1990 to 11 August 1991. (a) Attached to or regularly serving, for one or more days, with an organization participating in ground/shore military operations. (b) Attached to or regularly serving, for one or more days, aboard a naval vessel directly supporting military operations. (c) Actually participate as a crewmember in one or more aerial flights, directly supporting military operations in the areas designated above. (d) Serve on temporary duty for 30 consecutive or 60 nonconsecutive days. These time limitations may be waived by commanding officers for individuals participating in actual combat operations. c. Awarding Authority. Commanding officers are authorized to award the SWASM. (1) Defense of Saudi Arabia: 2 Aug 90 to 16 Jan 91. (2) Liberation and Defense of Kuwait: 17 Jan 91 to 11 Apr 91. (3) Southwest Asia Ceasefire Campaign: 12 Apr 91 to 30 Nov 95.